Andrej Trobec seems to have inadvertently captured the risk and balance of starting your own business through the perfect climbing analogy? Although, not unexpectedly. Andrej explains to me that climbing is connected to everything in his life, it flows through his workshop, the clothing and chalk bags that he makes and it emanates from him, it’s impossible to leave the Trinity Original workshop without feeling a sudden motivation to get out and find some rock. For many craftspeople, making comes first and the focus second, but for Andrej, everything is connected to the spirit of climbing. He’s been bouldering for about 15 years now, and sewing for 12 of these. He began making with his mother’s sewing machine, first a schoolbag, then adjusting clothes that he didn’t like the style of, and eventually making his first chalkbag. I ask how long his first bag took to make and laughing he says it took around a week, from the design conception to the finished product. He spent a lot of time thinking about style and design, whereas the sewing was relatively quick in comparison. But, although he still enjoys pondering on ideas, he doesn’t have the luxury of endless time these days, because, as he puts it “I need to eat!”. Andrej’s mum’s sewing machine is displayed proudly in the Trinity workshop, and Andrej has now collected at least six more. 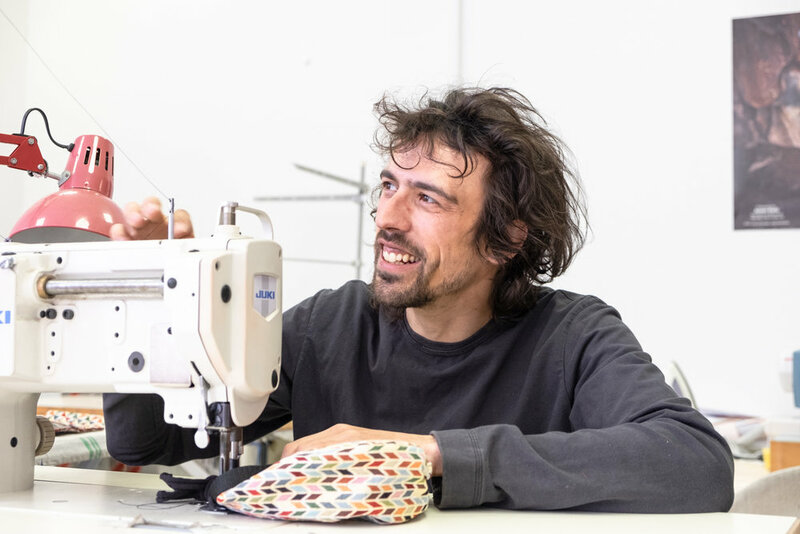 Part of his passion for sewing also comes from his relationship with the machines, fixing them when they break, looking after them and finding specialised machines for specific tasks and stitches. This ethos of seeking out the perfect tool for the job also connects to Andrej’s wider approach to craft. As an expert sewer Andrej has built relationships with other brands in Slovenia, exchanging skills and supporting one-another. He tells me “In the past I had the idea I would do it all by myself, but its not good, I changed my mind […] You can’t be a pro in everything, I need to find the people who are better than me in one particular thing.” He doesn’t need to go far. Skofja Loka has no shortage of master makers to lend a hand. It has attracted artists and artisans since the 13th Century, from lacemakers to blacksmiths, carpenters and painters. This proud tradition of creativity and making beautiful objects by hand is still attracting master craftspeople today. Andrej puts the finishing touches to a custom training board. As well as fabric products, Trinity Original also makes wooden climbing holds, and it is in this area that Andrej has branched out the most. Andrej’s expertise lies in sewing, but he is also a designer and artist, he creates the concepts, shapes and prototypes for the wooden holds, and he then collaborates with a local carpenter to create the finished products, all using wood from the forests surrounding Skofja Loka. We spent quite some time chatting about the increasing popularity of wood in the climbing world, which he champions for its less abrasive qualities, meaning you can train all day without damaging your skin or muscles. Andrej has seen the popularity of wooden holds explode, and we ponder the potential future where an eco-wall might be developed, shunning damaging plastic, which when they are new “you can smell in the air” and instead using wooden holds. This would be a huge transformation and would not only demand change to our expectations of climbing gyms but it could also revolutionise the way climbers train. All of the materials that Andrej uses are selected by him and although he doesn’t like to sell himself as an eco warrior, making sustainable choices are clearly an important part of that process. As well as choosing to use wood from the forests of Skofja Loka, we talk about the textile industry’s responsibility for levels of pollution, which, depending on the variables you use is between 2nd-10th most polluting industry. Andrej encourages his customers to think carefully about their purchases and then to wear it, fix it and wear it again. Making repairs beautiful is a side note to Trinity but Andrej does welcome the occasional visitor looking to renew an item of well-loved clothing. Andrej is proud to tell me that he has been offering unique repairs to clothing since he started out and it’s only relatively recently that the big brands like Patagonia have cottoned on. the 14th Century Capuchin Bridge, Skofja Loka. 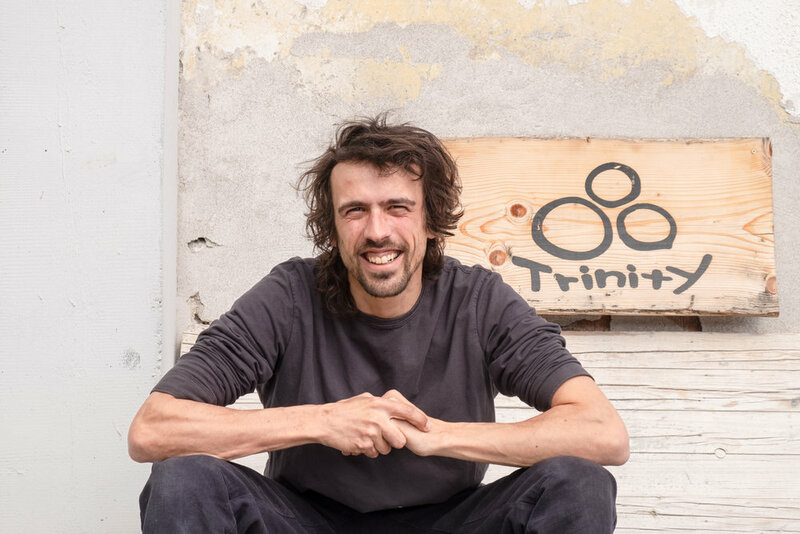 Part of Trinity’s appeal comes from Andrej’s commitment to using locally sourced materials and controlling his products throughout the supply chain. 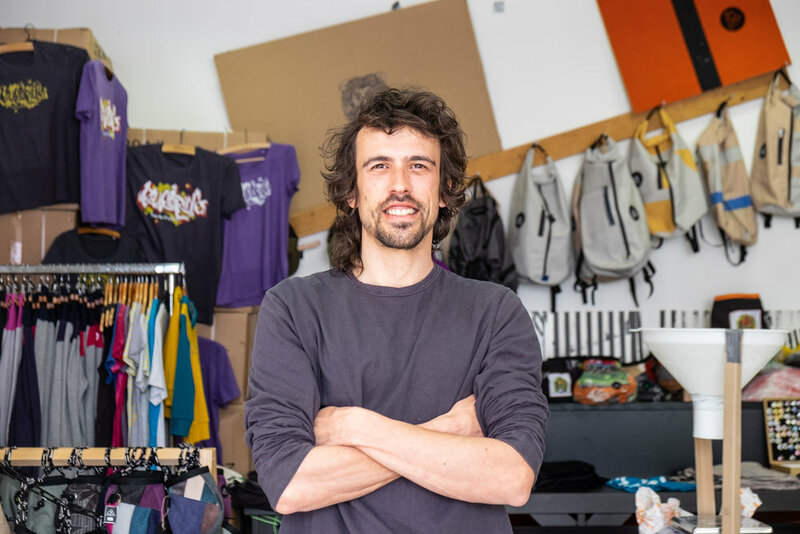 This gives each item integrity and although it is necessary for much of his fabric to come from distributers in Slovenia, Andrej still loves wandering through markets and bazaars on his travels and hand-selecting fabrics for small, limited edition lines of chalk bags and accessories. He concedes that because of this personal connection to his materials, it is sometimes hard to part with individual unique items that are directly connected to his own climbing adventures. Although, if you are enthusiastic enough, he can be persuaded to part with even his favourite creations!